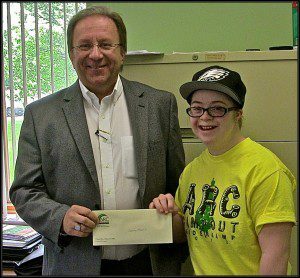 ARC of Oswego County thanks Sarah Powell for going above and beyond. On May 15, 2013, Sarah Powell presented $300 to Executive Director Michael Szpak. In addition, Sarah was instrumental in securing 20 new ARC of Oswego County memberships. Sarah is the key to our success. Please support our mission by becoming an ARC of Oswego County member today and help us to continue to create opportunities for our friends and neighbors through the success of our Membership Drive.